Serving the Jacksonville, Florida area. We use and recommend Harold Delaney for all your horse's hoof trimming needs. 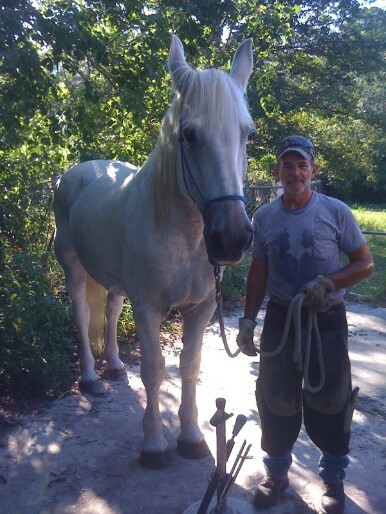 He has been the farrier for Pinto Carriage Works for years. I cannot say enough about this man. He is excellent at his work, gives a good trim every time, kind, gentle and patient with the horses, on-time and reliable. What more could you ask for? How about affordable? You got it! So if you need a farrier that you can trust, we recommend that you give Harold a call and tell him that Pinto Carriage Works sent you. It is the belief of Pinto Carriage Works that horses were born to be barefoot. They are a dynamic creature that when you give him the right training, exposure and trim, the horse's hoof can handle just about anything. It is unheard of in the carriage business for horses to be barefoot but just like a human walking barefoot outside all the time, the hooves toughen to the road with care and time. We work diligently with Harold's help to ensure that our horse's are the most comfortable and natural their whole life through. Our horses are athletes. These means they receive regular exercise, a proper diet and lots of turnout time to just be horses.